Very nice. Used the hotel for a one-night layover in the Orlando area, but the hotel staff was helpful. Overall very pleased with my stay..
room could have been a little more modern.. The hotel was very nice especially for the money we spent. It was a small suite as opposed to a regular room. It was at a busy intersection and it was hard to get out on the road. 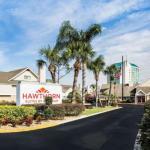 The 176 all-suites Residence Inn Orlando International Drive is located six miles from Walt Disney World and 10 miles from Orlandos International Airport. The pet-friendly, non-smoking property provides affordable accommodation for both the business traveler and families on vacation. Items included in the room rate are a hot breakfast buffet, a managers reception with beer and wine on weekday evenings, high-speed Internet access, local telephone calls, parking and coffee available in the lobby 24/7. The two-story inn has one meeting room for social or business functions that can accommodate 30 guests. The property is a close to the Orlando Convention Center and has a choice of accommodation - studio suites, suites with two queen beds, and two-story penthouse suites. All the suites have a fully equipped kitchen including refrigerator with icemaker, conventional and microwave oven, dishwasher, stove, toaster, silverware and dishes. Other features are a work desk with high-speed Internet access, telephone with voicemail, cable television with news and movie channels, pay-per-view movies, pullout sofa bed, alarm clock, tea and coffee making facilities, iron and ironing board and a hairdryer. The studio and penthouse suites have the added benefit of a fireplace. This hotel has an outdoor heated swimming pool, whirlpool, a fitness center and sports court. The complimentary breakfast is the only meal served here but there are several places to eat within walking distance of the property including a Perkins Family Restaurants, Dennys and a TGI Fridays. The front desk has safe deposit boxes and information on all the Orlando events and attractions. Other amenities include copy and fax services, a coin-operated laundry, picnic area with barbecue grill and valet dry-cleaning. Many families return to this inn for their annual vacations in Central Florida. They say that the property is not the newest in the area but they consider it to be the nicest. The attractions are the affordable rates, clean and comfortable accommodation and the expansive and complimentary breakfast buffet. The employees get good reviews for taking care of problems promptly and being friendly and efficient. There is plenty going on close to the hotel and Mickey and his friends are only a short drive away. The large number of returning guests is a great recommendation.